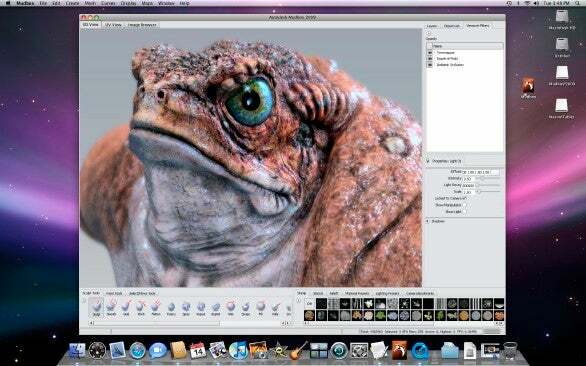 Autodesk on Monday announced the release of Mudbox 2009 for the Mac. Mudbox is digital sculpting and texture painting software used in the film, game and design industries. Mudbox helps you create high-polygon 3D models using tools familiar to traditional sculptors. It also sports multi-resolution mesh editing, texture "baking" in 8-, 16-, and 32-bit maps, support for 3D layers, with blending, masking, erasing, mirroring, and merging capabilities as well. New features in Mudbox 2009 include the ability to paint reference images onto the model from screen space using a new Projection brush, the ability to paint multiple maps on multiple meshes simultaneously, performance improvements, multiple maps and texture channels per mesh, accurate shadow casting from multiple light sources, High Dynamic Range (HDR) light source support and more. System requirements call for Mac OS X 10.5.5 or later, Intel-based Mac, qualified graphics hardware, 1GB RAM, 650MB hard disk space.